So why would I choose to present a Lightning Talk? For me, the shorter time format of getting my idea across in five to seven minutes was a challenge that I had not attempted yet. I attended Lightning Talks at the 2016 and 2017 SIGUCCS conferences and found the presentations to be emotionally engaging and mentally stimulating. I wanted to be one of the “cool kids” presenting in an informal yet structured environment. I loved the possibility of including props or a costume or speaking from the heart to make a point or delight the audience. I also took advantage of not writing a paper to support the talk since papers are optional for Lightning Talks and I had a lot of SIGUCCS Conference responsibilities in 2018. I didn’t have the external deadlines imposed by writing a conference paper. I scheduled a “brown bag lunch” rehearsal to present both of my Lightning Talks to co-workers three weeks before the conference to force me to prepare well in advance. The dry run gave me an opportunity to time the presentations and see how well my content played before a live audience. 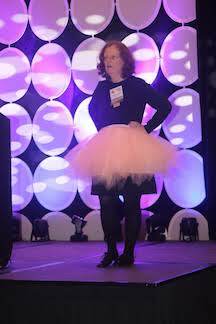 To make this session a true “dress rehearsal”, I even wore the outfit planned for one of my talks so I could test my tutu. I used attendee feedback and my internal critiques to make changes to my PowerPoint files, deleting or modifying some slides to maintain focus and stay within my time limit. Lightning Talks are tightly scheduled with a presenter getting ready while the previous one is fielding questions for two minutes. To ease the transitions, the presenters decided to use just one laptop for all five Lightning Talks during that session. I had to submit my final PowerPoint slides in advance for copying onto the shared laptop. Submitting the PowerPoint file in advance helped me relax during the day of the presentation since I knew I could not make any more changes. Of course, in case of unexpected technical issues, I brought a laptop and a copy of my presentation on a USB drive to the session. From observing other Lightning Talks and my own experiences, here are a few tips for success for future presenters who choose to display slides during their Lightning Talks. (1) I decided to omit or hide any slides during the presentation that talked about my university or department. I only had a few minutes and I wanted to focus on my topic. (2) I added content to the speaker notes for some of the slides and created a slide at the end with a list of references since I did not write a paper – this additional information and any hidden slides would be visible to those who download the presentation file later. And last but not least, (3) I made it a point upload my presentation files to sched.com as soon as possible after the Lightning Talk sessions so attendees could obtain them while they were harvesting conference presentation files. I truly enjoyed creating and presenting Lightning Talks at the 2018 conference and felt that I was a part of something larger than myself. If you would like to join the fun of presenting a Lightning Talk or a longer presentation, submit your ideas to the SIGUCCS 2019 Conference Call for Proposals(deadline is March 8). Feel free to ask questions and share ideas on the SIGUCCS Slack channelas you refine your conference proposal.